One warm, sunny day, three summers ago, I had the gift of meeting Daliah Medhi on Halsted Street. I was selling my work at the HUGE Boys Town extravaganza know as Halsted Street Market Days, for the extraordinary design boutique - ID. Daliah found me in the early morning calm - before the party started. Before the immaculately cut, shirtless waiter boys nextdoor at mini bar started strutting their stuff to the ever present club beat, before the throngs of people crowd the street curb to curb. She wandered over, looked at my work, and asked if I could create a piece that would define her love and her family. WOW. A tall order. An honor and a challenge. She had a particular phrase in mind from the Book of Ruth, "Where you go, I will go". She explained it's the only time in the bible where a woman makes a commitment to another woman - Ruth (newly widowed) commits to Naomi (her mother-inlaw) that she will not leave her. As she told me the whole story we both teared up. Oh Yeah - we're crying over bible stories while the shirtless boys in dangerously low board shorts were setting up Bloody Mary service. Two gals crying as Donna Summer remixes reached acceptable club levels. Beautiful. Done. Where you go, I will go. Kyan was an infant when I met Daliah. Our lives have changed a lot since then. I owe much of the newest collection to Daliah and Kyan - the love and commitment pieces. 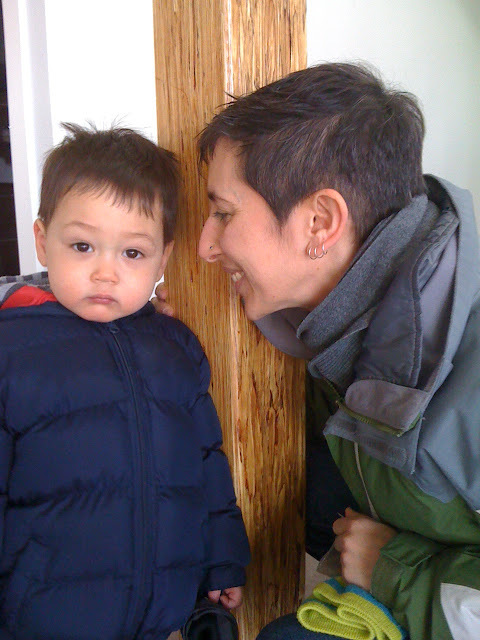 Here is a picture of Daliah, and her breathtakingly cherubic Kyan, when they stopped by the studio this week - he's now two! Daliah has a new piece - "Light before darkness, darkness before light". I'm forever grateful to them, the definition of love. So that's the story of that piece! So very interesting. What a great pic, too!